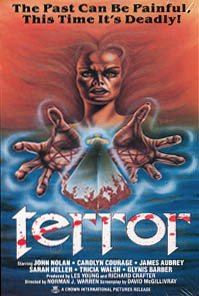 Directed by Norman Warren and released in 1978, Terror is an above average supernatural slasher that maintains interest with both its intriguing plot - as well as the elaborate death sequences created and crafted with obvious care. Film director James Garrick (John Nolan) has made a feature based on his own family's long history. The movie begins. A town crowd moves to burn a witch...unsuccessfully. An undisputed mistress of evil, the witch escapes destruction and exacts revenge upon those who wished her dead. End reel. Gathered at his estate, Garrick's friends are titillated by their friend's creation. Is it true? Those events happened right here in this same house? Garrick's glum answer is in the affirmative. With the conclusion of the evening's entertainment, poor Carol (Glynis Barber) leaves the party only to be brutally knifed to death in the woods outside the home. Is the culprit merely a wild madman on the loose? Soon, a stranger comes into contact with Garrick's cousin Ann (Carolyn Courage) and finds a grisly death at the end of a spiked fence. Still another psycho...or is there some validity to the Garrick curse? Events begin to really spiral out of control as a boarder at Ann's hostel is mercilessly offed by a large butcher knife. Convinced that the recent murders are all part of the witch's retribution, Ann visits Garrick's assistant Philip (James Aubrey) and confides her fears. His boss and herself are the last of the line...soon the curse will have won. But will it? And how will it play out? Alone, Phillip finds a stage set come to life, a mass of film temporarily engulfing him in its blob, mirrors crashing off the walls, a bathtub explodes into flames. But Philip manages to get immediate sanctuary in an adjoining staircase, where he falls backward down the stairs, one by one, landing prostate with a firm plop in an open window. For horror aficionados, Terror offers up a nice bounty of murder highlights, all resoundingly done with love and attention. Clearly, the deaths in Terror are director Norman Warren's chief concern...and it shows, with generally positive results. Wedged in between the splatter moments of Terror come a few bizarre sequences of the supernatural. Trapped alone in her car during a windy night, Ann finds the car slowly levitating upwards, where it stops suspended amongst the branches of a high-reaching tree. A brave setup to attempt, the sequence is executed with nerve and verve and elicits an eerie shudder. The climax of Terror reverberates lightly with echoes of Suspiria. Red and blue lights flicker like sirens out of control, wind rushes into a closed room and the last member of the Garrick clan scrambles for life. Without much doubt, this is the sort of late '70s enterprise that will delight some horror fans while frustrating others. Darkly lit at times and mounting a climax that offers little narrative explanation, it's often a mixed bag when it comes to straightforward exposition. But what is most effectively underscored throughout is the agreeable nature of most of the characters in Terror, a generally sympathetic lot unaware of the nasty ends that await them. And with those nasty ends, the film finds its real purpose.